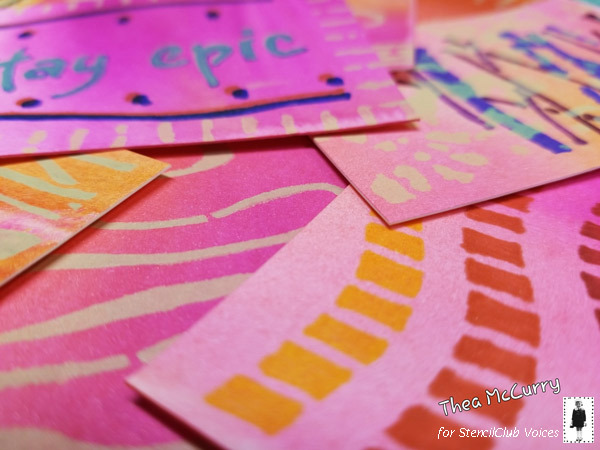 StencilGirl Talk: StencilClub Voices Made Magic this October! StencilClub Voices Made Magic this October! Carol Baxter here. Salutations! Welcome! 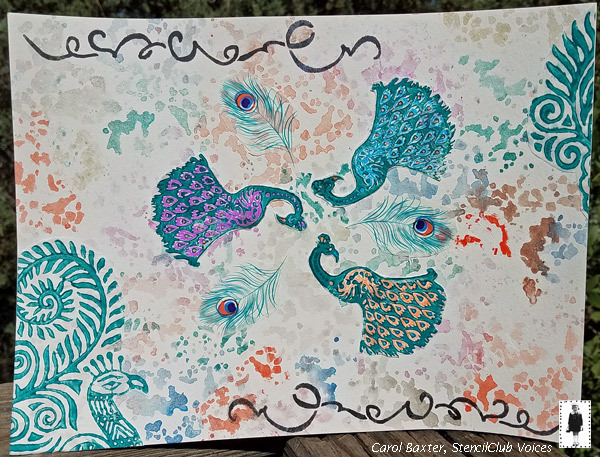 Are you ready to Stay in Your Magic with Nancy Curry's StencilClub set of stencils! 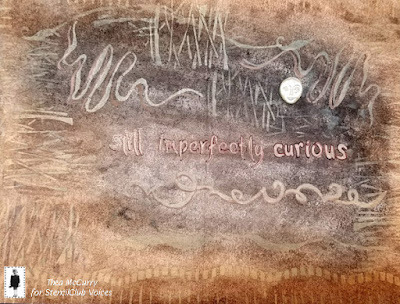 I was and so were our StencilClub Voices, Elaine Huffman, Thea McCurry, Christy Anne, and Nancy Taylor. The more I look at this set, the more I see the hidden magic in it! 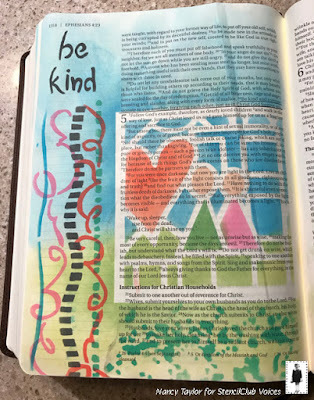 I especially like all the line on the large stencil and see lots of possibilities for journaling on the straighter ones, but my current fave is the one I stenciled below with acrylic paint. My brain keeps trying to make it a word, universe, inverse, erases, whatever it may or may not be it sure looks cool! I used 5 watercolors on watercolor paper and the mini stencil to create the background without anything in particular in mind to do next. When it dried, I realized it matched peacocks from my stash so I inked them up with gel pens then glued them on along with cutouts from the feathered tissue paper they came in. What you can't see is where I used a white pen to outline some of the words from the small stencil! 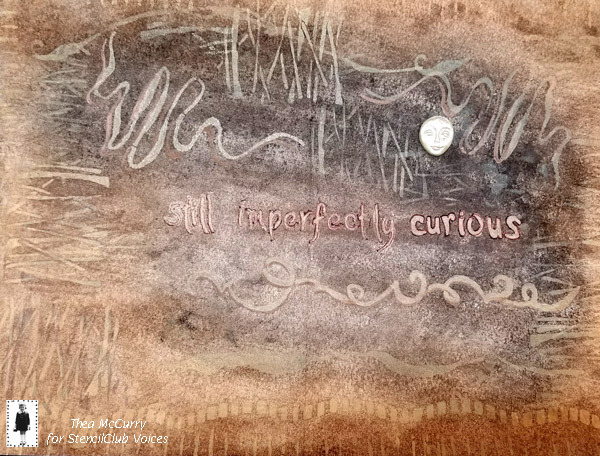 Elaine Huffman's art journal page is a stream of consciousness in color. She painted the background with Golden acrylic paint and just kept going with layers of stencils and mark making. 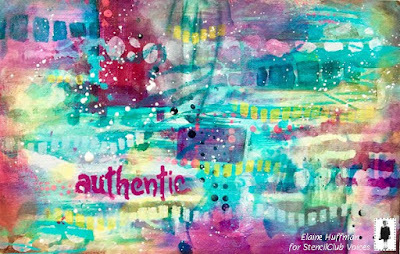 Elaine says, "This page is unique for me in that I limited my materials to Golden paints and StencilGirl stencils." 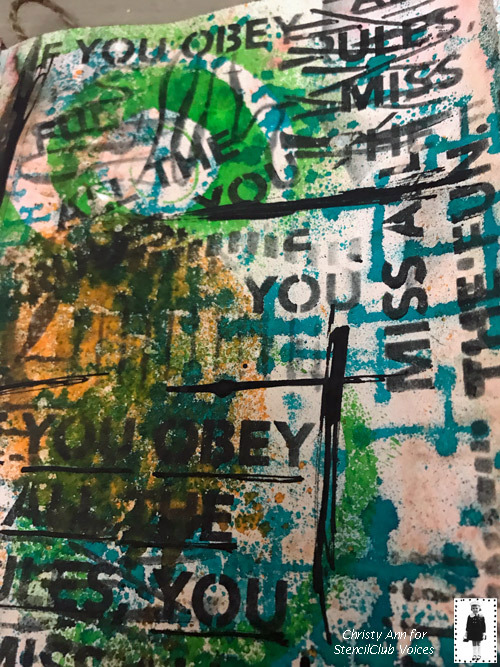 Christy Anne was working on prompt #14, to use her favorite quote, for her Stencilfied Journal when the large "Stay in Your Magic" stencil leaped off her desk. Christy was so excited about the page, she posted it for a few seconds before realizing she had to wait. Her art journal page is sprayed and inked and also uses the mini stencil from August 2018 StencilClub. 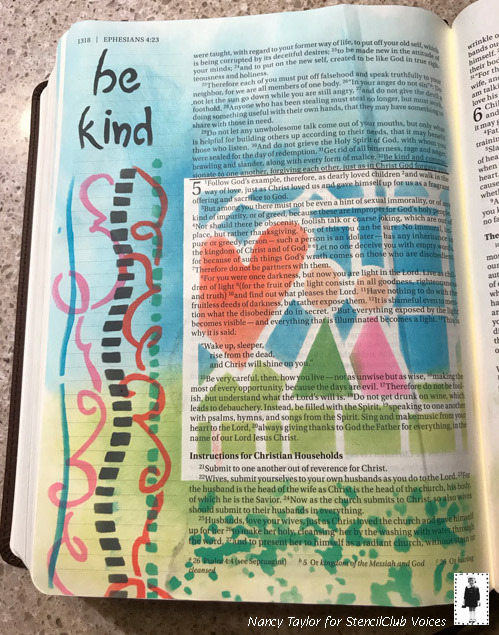 Nancy Taylor used distress oxides along with the large stencil from this month and the mini stencil from November 2017 StencilClub to personalize Ephesians 4:23 in her Bible journal. The more Thea McCurry played, the more she got into the groove with the "Stay in Your Magic" StencilClub set. Here are a few ATC cards she made by spraying watercolor paper with "inky goodness", then cut into ATC sized pieces. She used an assortment of markers to stencil in lines and words. Thea also made this lovely, sepia-toned art journal spread combining charcoal sticks and pastels along with markers and a little face from my stash. Thea asks, "Do brown and gray play well together? You decide." 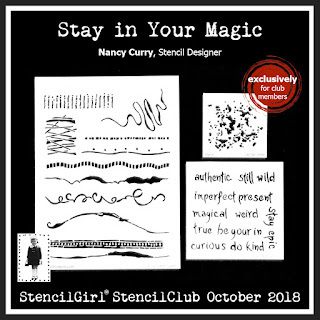 You can see Nancy Curry reveal her "Stay in Your Magic" StencilClub set HERE and she has 2 fabulous projects for members to download! Details about StencilClub membership stencils, coupon, Facebook group, and other perks can be had via this LINK. I can't wait to receive this month's club stencils. I love this set. Beautiful ideas from everyone.